Anurag Khatiyan born in a village named Lachera at Muzaffarnagar in Uttar Pradesh(INDIA). He is a businessman & founder of North India Hydraulic Industry Roorkee(NIHI Roorkee). Originally belongs to the Jaat farmer family of Muzaffarnagar district(UP). He generally deals in trading & assembling of hydraulic system types of equipment. Post Graduate Diploma in Management(PGDM) – Finance & International Business from Institute of Management Education(IME), Ghaziabad. He also has a degree of Master of Commerce(M.Com) from CCS University. Completed Diploma in Software Engineering from NIIT, Delhi. Done his schooling in commerce from the Muzaffarnagar district. He also having NCC(National Cadet Corps) ‘A’ & ‘B’ certificate. He got married in the year 2013. His wife name is Mrs. Anjana Khatiyan. 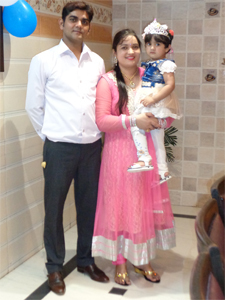 Having two daughters named Ms. Ishani Choudhary & Ms. Misti Choudhary. “Behind Every Successful Man, There is a Woman”. As per him, during his job days, he used to talk about a business that pertaining to his current concern then his wife forced him to quit the job and advised & supported him to do what he was dreaming. This is how with the support of her he then left the job and started following his passion & founded North India Hydraulic Industry Roorkee i.e. NIHI Roorkee in the year 2015. Permanent Address: Village & Post – Lachhera, District – Muzaffarnagar U.P. (251001). Worked as Financial Analyst at GKC Management Service (P) Ltd., Delhi. 2 Months Summer Project ONGC Videsh Ltd. (OVL), New Delhi. 7 Months internship with Appco Marketing India Pvt Ltd (Management Trainee). Visited Company Parle Biscuits Pvt. Ltd, Neemrana (Rajasthan) and Learn about the Management Information System (MIS) of the company. Visited the Paradise Plastics Enterprises Ltd, Noida & he learns about the Management Information System (MIS) of the company. GKC Management Service Pvt. Ltd.
We were the vendor of HDFC, TATA CAPITAL, FULLERTON INDIA, RBL, CAPITAL FIRST etc. To analyze the financial strength of the SME (Small Medium Enterprise). Reading financial statements of the organization and also taking into consideration the sales, expenses and production cost, in order to advise for future earnings of the organization. Preparing the report on the basis of analyzing past financial performance and projecting the financial profitability of the companies. Preparing profit and loss account, balance sheet on the basis of our own assumptions and market trends. Ratio Analysis of the financial statement, to check the client’s business stability and present position. Submission of the report and give recommendations. Compile, summarize and analyze the credibility of the company on the basis of financial record such as P&L A/C, Balance sheet. Appco marketing India pvt ltd.
To tell about the products and services to the customers. To train newcomers about the products. NIHI Roorkee is the hydraulic hose industry leader that has several years of experience in the trading & assembling space. NIHI Roorkee provides the essential hydraulic kinds of stuff say hydraulic hoses, adapters, pressure meters, hydraulic oils, industrial hoses, and allied items to all the manufacturing units. Currently, NIHI Roorkee covers all the industrial areas of Uttarakhand State of India & also some of Uttar Pradesh. So Mr. Anurag Khatiyan since his childhood keen in doing business & after quitting his job in 2015 he decided to become an entrepreneur & now he is his own boss. Huge thanks for reading the biography of Mr. Anurag Khatiyan till the end. Hope you liked it.